Improve your game with my top table tennis techniques and tips. The modern game of table tennis has become one that's dominated by players who play very fast aggressive loop shots and who use an attacking / offensive style of play. 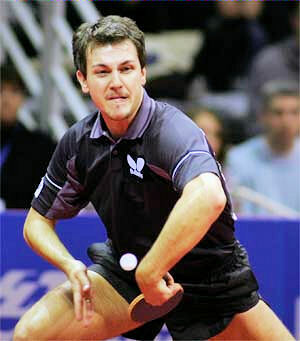 Timo Boll (pictured right) is one of the top players in the world and he imparts tremendous spin onto the ball, particularly with his backhand loop. He generates this heavy topspin with a combination of a very loose wrist action, his body movements and his attacking / offensive rubbers. The loop shot is used frequently by all the top players in order to play aggressively and to minimise the opportunity for their opponent to play an attacking stroke. Of course, coping with your opponents fast attacking shots is an advanced technique, so it's important that you've mastered the basics of table tennis first, such as the table tennis grip, the table tennis stroke and the basic table tennis serve. But once you've mastered the basics, you'll be ready to move on to an advanced level of table tennis. If that's you, I hope you'll find these tips and techniques useful. I'll also be covering other table tennis techniques including - mastering spin, the backhand block and forehand block, the backhand chop and forehand chop. Then I'll move on to the advanced table tennis serve including the short backspin serve, the backhand sidespin serve, and the forehand high toss serve. Finally, I'll cover the advanced return of serve including the short push return, the fast attacking push return and the forehand flick. Using a medium stroke, your racket arm should move forward and upwards in the direction that the ball is going to travel, whilst your free arm should point towards the ball to assist with your body turn and balance. During your stroke, you should use all three joints of your playing arm to produce maximum spin and you should push strongly with your legs to accentuate your body movement. Here are video demonstrations of the backhand and forehand loop. To vary the amount of spin on your shot, hit the ball either before or after the top of the bounce and also ensure that you use a loose wrist action to help you generate racket speed and spin. As you perfect your basic loop technique, you'll be able to play even more aggressive loop shots, from positions further away from the table. Standing further away from the table enables you to have more time to react to your opponent's attacking shots.